Update to the 2015 NFPA 3 -- the only complete commissioning program for fire protection and life safety systems. Developed in response to a request from the National Institute of Building Science (NIBS), landmark NFPA 3: Recommended Practice for Commissioning of Fire Protection and Life Safety Systems outlines a process for the commissioning of interconnected safety systems, to help stakeholders verify that systems are designed, installed, and function as intended. 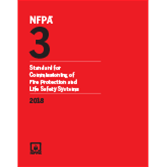 NFPA 3 now works with NFPA 4: Standard for Integrated Fire Protection and Life Safety System Testing. The second edition of NFPA 3 covers the complete commissioning process for system operation throughout the building's life cycle. Guidelines for an Integrated Testing Plan and the role of the Integrated Testing Agent (ITa), formerly located in Chapter 7, have been extracted and expanded into the all new NFPA 4: Integrated Fire Protection and Life Safety System Testing. Other changes in NFPA 3 clarify commissioning procedures, methods, and documentation for architects, designers, contractors, owners, and AHJs. Make sure integrated systems are able to function as designed.